Anne of Green Gables is Lucy Maud Montgomery’s most famous literary creation. But there’s another character in the Anne books that is arguably just as important as Anne–and that is the setting of Prince Edward Island itself. You can open up any of the stories of Anne Shirley and lose yourself in Montgomery’s masterful reflections of Canada’s fair island. Or you can go there yourself and experience it firsthand. We fell in love with Prince Edward Island in the summer of 2007. On that trip, we based ourselves in Charlottetown and explored the central and eastern side of the island, discovering the charm of its red, sandy beaches, sleepy villages, and awesome ocean views. On one of our last daytrips, we discovered St. Peter’s Bay, a picturesque inlet and home to beaches, forest trails, and a sense of quiet solitude. We vowed to return here next time. 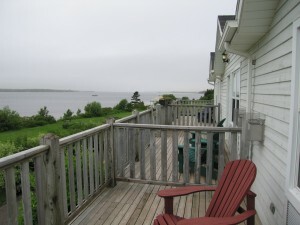 Two years later, we booked a stay at the Inn at St Peters, an intimate hotel on the St Peters Bay waterfront. A short drive from Charlottetown, the town of St Peters is a lovely, quiet and inviting place. The approach to the town is dominated by the bay itself, and a great, white church across the water, on the same side as the Inn. Head toward the church, turn left, and you are almost there. The Inn itself is the ideal place for a restful retreat. 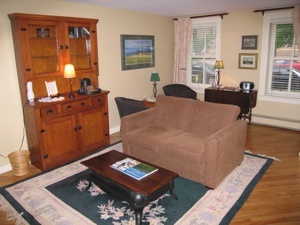 Innkeepers Karen and Garth have done a wonderful job creating an environment that is beautiful and welcoming. They extend warm hospitality and a “let us know what you need” atmosphere, yet your privacy is always respected. Reception takes place in the great building, which also houses the large, airy dining room. Accommodations are housed separately from the main building, and just a short stroll away. The grounds are immaculately kept, and gorgeous flowers bloom in neat, winding rows along pretty walking paths. (We were amazed at how green and n bloom everything was for our mid-June stay. The huge clusters of irises were especially breathtaking). 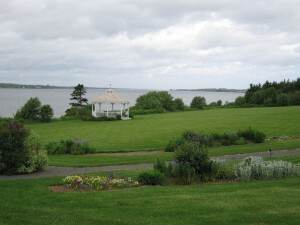 The peaceful inlet, lush green grass, and elegant flowers invite calm and relaxation. Our King Suite was also very pleasing. Spacious, and spotlessly clean, we enjoyed a comfortable sitting area, fireplace, TV and DVD player, as well as a deck overlooking the water. The Suite is a single room, so there is no private bedroom/lounging space. However, this did not affect our enjoyment as we spent our days outside enjoying hikes and scenic drives, and our evenings lingering over delicious cuisine at the Inn’s dining room. I suppose here’s the perfect time to mention the gourmet dining provided by Chefs John Haines and Tracy Wallace. It was certainly a highlight of our stay. Sumptuous first courses included offerings such as “Nova Style” House Smoked Salmon with Avocado Oil and St. Peters Bay Mussels (from but a few feet away!) steamed in White Wine, Butter and Rosemary Cream Sauce. Noteworthy mains included Lobster Ravioli in a Garlic Infused Cream Sauce, and Bacon Wrapped Filet Mignon with Aged Cheddar Croquette Potato, Shiitake Mushrooms, Caramelized Shallots and Balsamic Grilled Vegetables (landlubbers are not excluded here.) A fine wine list added to our enjoyment, and Karen, who was often present in the dining room, shared her knowledge and enthusiasm about wine with us. We stayed at the Inn for five nights; a rejuvenating amount of time. Our particular vacation package included a nightly three-course dinner, as well as a full, hot breakfast. It was too much food, really, but far better than leaving you wanting. 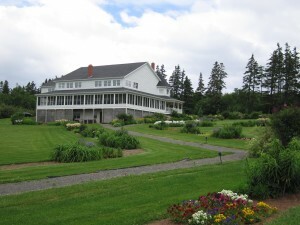 Other packages at the Inn include first-class golf, cycling day trips, and a “City and Sea” package where you share your holiday between the Inn at St Peters, and the attractive Shipwright Inn near Charlottetown’s harbour front. We opted for the dining package, and chose our recreational activities depending on our mood day to day. A note on nature – at the time of year we visited (mid-June), we found the mosquito population thriving. Apparently mosquito fogging is not done on the Island. Especially on hiking expeditions in treed areas, we recommend that you bring along bug spray for maximum enjoyment. Beach excursions are another matter – but if you are heading for the trees, be aware that you might have some irritating company. Charlottetown is a beautiful place to stay, and hardly a big, bustling city. However, for an even deeper sense of peace and seclusion, consider beautiful St Peters Bay. We give the Inn at St Peters 4 and 1/2 Stars – Outstanding! It seems to me that you could spend a lifetime exploring Canada. “From Sea to Sea”, there are so many breathtaking sights, pristine landscapes, and fascinating cities to experience. And no matter where you go, you’re sure to find that comfortable and friendly Canadian character. If you rent a car, which we highly recommend, Charlottetown is a great base and starting point for day trips which take you to red sandy beaches, through scenic farmland with gorgeous rolling hills, from lone lighthouse to lighthouse standing guard over the rocky shoreline, and to the recreated dwelling place of the Island’s most famous red-head, Anne of Green Gables. We were thoroughly charmed by the beaches and views at St. Peters, a small town not far from Charlottetown. We also found Cavendish, the tourist-magnet of the Island, to be less busy than we had assumed. Certainly, our visit to Green Gables was relaxing and interesting, and not jam-packed shoulder to shoulder with Anne fans. A fan of the Anne books myself, I was overjoyed at the re-creation of Lovers’ Lane and the Haunted Wood, two short walking trails nestled among the trees on the Green Gables property. And I was truly inspired by the educational film about Lucy Maud Montgomery’s remarkable life and career. Our enjoyment of Charlottetown was enhanced by the unique character of our hotel, The Great George. Actually several heritage buildings re-developed into Inns, each with their own personality, The Great George will certainly be an important part of your stay. The location of the hotel was quite wonderful, putting us in walking distance of the major attractions of Charlottetown, such as the wharf and its restaurants, the boardwalk, local arts and crafts stores and galleries, the arts and entertainment centre, and also more “generic” shopping destinations – which you just sometimes have to visit! The Inns at The Great George are linked by The Pavilion Building which, in addition to housing several guestrooms, is the location of a common lobby area. The lobby is furnished like a large, elegant sitting room with plenty of vintage chairs, sofas, and loveseats for lounging with the paper with coffee in the morning, or a drink in the evening. A buffet breakfast is served to guests each morning, with a fine selection of pastries, cereals, fruit, coffee and tea (get up early before the fresh-picked raspberries run out!). Attendants are quick to provide you with small folding tables, and remove dishes quickly, making you feel like a valued guest and surpassing the more usual, “functional” continental breakfast experience. You will also find helpful staff in the Pavilion who generously provide maps, brochures, and great suggestions for island day trips and thing to do closer by. As for our particular accommodations, we stayed in a spacious suite in the Witter Coombs House. The long room was divided into a generous sitting area, complete with a fireplace, and a sleeping area enhanced by a luxurious Jacuzzi tub. 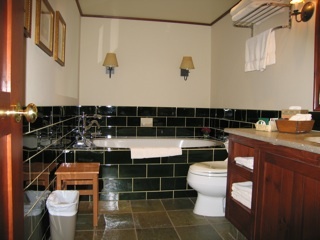 A large bathroom with separate shower completed the room, and high-quality Aveda toiletries were generously provided. The décor was tasteful and comfortable, and housekeeping services was attentive. The shortcomings of The Great George are few, and mostly due to the same factor that makes it charming: its heritage character. For instance, though air conditioned, the wall-unit was quite noisy and took away slightly from the overall feeling of comfort and relaxation here (though the cool air in the hot August weather was appreciated!). Our particular suite was also adjacent to the parking lot. This proved to be a busy and noisy place, even late into the night with guests coming and going, and visiting with one another on the patio. The parking lot is in itself another drawback for The Great George- space for vehicles is extremely tight in the lot, and street parking is highly restricted. Though this never ultimately resulted in a problem for us, parking was an issue and there was always a lingering feeling of uncertainty about whether or not we would get a space for the night. These small shortcomings aside, our overall feeling and experience at the Great George can be characterized by elegance, and a sense of welcome. Being in walking distance to the most picturesque sites of the city and the best seafood dining was invaluable. We look forward to a future visit to The Great George, perhaps to one of its other Inns to experience another unique accommodation of this fine establishment. We give The Great George 4 Stars – Excellent! 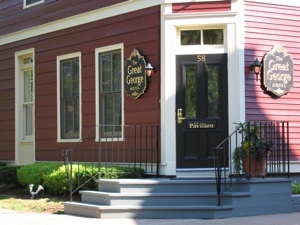 The Great George is located at 58 Great George Street, Charlottetown, Prince Edward Island. 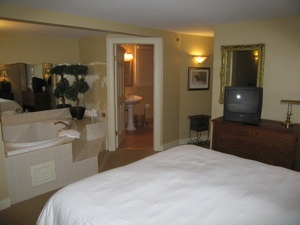 For hotel reservations call 1-800-361-1118, or visit www.thegreatgeorge.com. Three stunning new towers now grace the ever-changing skyline of the famed Las Vegas strip. What a spectacular place to stay! At The Signature at the MGM Grand, you have the access to the strip and all of its amenities (for which, no doubt, you made the trip in the first place), but you can “come home” to a luxurious place that feels relaxing and far away from the non-stop action, making your Vegas vacation truly a vacation! We stayed in a gorgeous junior suite on the 26th floor of Tower One. With a spectacular view of the strip, we were energized by this “city that never sleeps.” However, we were surrounded by such luxuries and sense of welcome that the stress we had come here to escape instantly evaporated. Our bed and linens were incredibly comfortable. (I’m prone to having a few nights of “adjusting” to my new sleeping place, but not here). I’m not sure many people associate coming to Vegas to sleep like a baby, but I assure you, it can be done at The Signature! And though you are somewhat off the strip, it’s more of a feeling than an inconvenience. A quick covered walkway (complete with “Meet George, Jetson”-style moving sidewalks) gets you to the adjoining MGM Grand in a matter of minutes. Once you’re there, you’re in the midst of the massive MGM Grand casino, shopping, some of the best restaurants in Vegas (be sure to check out Nobhill and the incomparable Joel Robuchon), and of course, quick access to the strip itself. Worthy of note (especially for one as inclined toward coffee as myself!) is the Starbucks just off The Signature’s lobby. Stopping in for a latte before hitting the strip made for a great morning ritual. As a Signature guest, I also took advantage of access to the MGM Grand All-Access Spa Pass and indulged in a treatments at the decadent MGM Grand Spa. Our stay at The Signature proves that you can come to Vegas to relax. Highly recommended! We give The Signature at MGM Grand 5 Stars- Outstanding! There is no more breathtaking setting than the dazzling, turquoise mountain lake, Lake Louise. Nestled between a glacier and towering Rocky Mountain peaks, the lake is a pool of serenity that sends any onlooker into deep contemplation about nature and its creation. Even the constant bustle of people milling around at the lake side, having group photographs taken against the scenery, chatting in every language in the world cannot take away from the calm, soul-soothing sight of water, stone and snow. And so one cannot imagine a place to stay that could surpass the grand Chateau Lake Louise that sits overlooks the lake and stands seemingly level to the mountains. A lakeside room may be the finest accommodations on the planet. But setting “setting” aside, there is another place tucked away in Lake Louise. If it lacks the supreme view, it more than makes up for this shortcoming in terms of service, dining, and other luxuries. 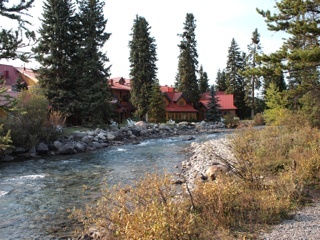 The Post Hotel is located in the town of Lake Louise itself about a five minute drive from the actual lake. This luxury log chalet is set beside a babbling mountain brook and majestic, rich green pines. Strolling over the brook’s bridge, one is sure to see cheerful, billowy clouds of smoke coming from several of the hotel’s chimneys. Several rooms and suites are outfitted with a stone, wood-burning fireplace for chilly mountain mornings all year round, cozy après ski afternoons, or romantic evenings. The fireplace alone is a reason to go (and return) to the Post Hotel. Staff cleans the fireplace and refreshes the wood daily so that you can always keep a glowing fire burning. And it is only the beginning of the luxuries. 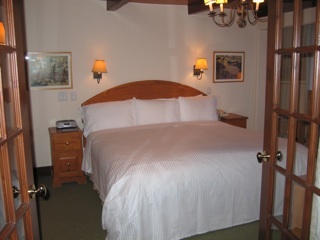 The rooms, cozy and attractive with wood-beamed ceilings, are outfitted with fine sheets and down pillows and comforters. You sink into the homey yet tastefully patterned sofas and chairs set in front of the fireplace. Bathrooms are spacious, clean and modern, complete with an air tub and fine Aveda products. Even the towels are lofty and cozy. And this is just the sort of touch that you come to expect at the Post Hotel where the greatest attention is paid to the smallest detail to make you feel transported, pampered, and worry-free. Our sole complaint about our room paired with a strong recommendation–when staying at the Post, be sure to request a room on the “Preferred Side” as opposed to the “Standard Side”. Not only is the view better, but across the parking lot on the Standard Side is a rail line with trains constantly making their way across the Rockies. Charming in postcards, but not so at four in the morning. I’ll say it again–insist on the Preferred Side when making your booking. 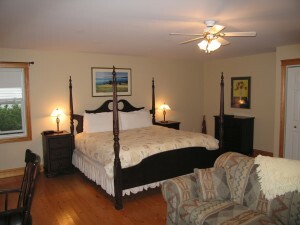 The hotel itself is spacious, with a main building, and several private cottages along the mountain brook. If you need a change of scenery from your room or the unparalleled outdoors, an attractive reading room,the great room of the chalet, is steps away. Comfy reading chairs, board games, and walls lined with books make this room a particularly homey and relaxing way to spend a few hours. The Temple Mountain Spa is another way to wile away hours at a time while at the Post Hotel. With private treatment rooms and luxury products, this is a must for anyone who loves to be pampered. And we have saved the best for last–the dining. It is truly spectacular. With one of the largest wine lists in Canada, the Post Hotel excels at every aspect of fine dining. Under the masterful direction of Executive Chef, Swiss-born Hans Sauter, the menu is tantalizing and portions almost too generous. With incredible seven course tasting menus, or items like lobster with morel mushrooms and port reduction, you will leave filled and fulfilled. 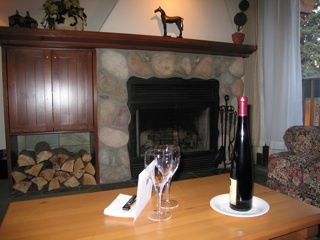 The décor is inviting–tasteful without being stuffy, reflecting the relaxing yet refined alpine chalet atmosphere. A grand stone fireplace enhances the romantic, mountain mood. The Chateau may have the view, but the Post Hotel has the food. Consider the Post while at Lake Louise. Yes–visit the lake, take the scenic hikes, book a seating for High Tea at the Chateau, and dine at the Waliser Stube there for a classic cheese fondue–nobody does this better than the chateau. But you will not regret returning to the Post to be pampered, to luxuriate over food and wine, to be served like you are a cherished guest. This is what a holiday is all about. We give The Post Hotel 5 Stars- Outstanding! The Post Hotel is located at 200 Pipestone Road, Lake Louise, Alberta, Canada, T0L 1E0. For hotel reservations call (403) 522-3989 or Toll Free in North America at 1-800-661-1586. Email [email protected] or visit www.posthotel.com for more details. Montreal is a large, Canadian city with an undeniably unique character. Some describe it as “European”. Other appropriate adjectives may include “artistic,” “creative,” and “vibrant”. However one might describe Montreal, without a doubt, it is special. In part, it’s the stunning architecture in the Old Port, including the breathtaking Notre Dame Cathedral, that creates this impression. And the mingling of languages and ethnicities, including but certainly not limited to French and English. Unique neighborhoods alive with ethnic shops, art and cuisine – perhaps this is what helps to define Montreal. I’m sure that it’s all of the above, and more. Certainly, Montreal felt to me more than the usual big city, particularly in the summer when we last visited . I’d been there before, in the dead of winter, and in the beginning of spring. And while these seasons showed the city in good form, it’s true that in summer Montreal truly comes alive. The restaurants opened their doors and windows, allowing eating and spirited conversation to spill out onto the streets. Festivals were so abundant, they overlapped one another in time and space. You could not turn around for all the outdoor entertainment and colorful parades. Creative expression was everywhere. We stayed at the Fairmont The Queen Elizabeth hotel, located in lively downtown. Though we discovered other boutique hotels especially in the Old Port with perhaps more in the way of character and ambience, The Queen Elizabeth was a luxurious, centralized placed to stay. A large, gracious hotel, The Queen Elizabteh is in walking distance from great shopping, restaurants, and the historic Old Port. It would certainly be an ideal location for guests year-round. Add to this its proximity to the world renowned festivals held in the summer, such as the famous Montreal Jazz Festival, The Queen Elizabeth is the ideal place to call home during your summer stay in this beautiful city. Certainly, our comfortably furnished, air conditioned room was a welcomed retreat from our time spent strolling about in the scorching July heat. Some of the palpable character of Montreal dissolves in this hotel, perhaps due to its size – surely the boutique hotels in the Old Port offer a more colorful or romanticized impression of the city. Still, you will not be disappointed in the comforts afforded, the level of service, and above all, the proximity to so much of what Montreal has to offer.